The Highlights of Dubai Design Week 2016 by Yatzer. 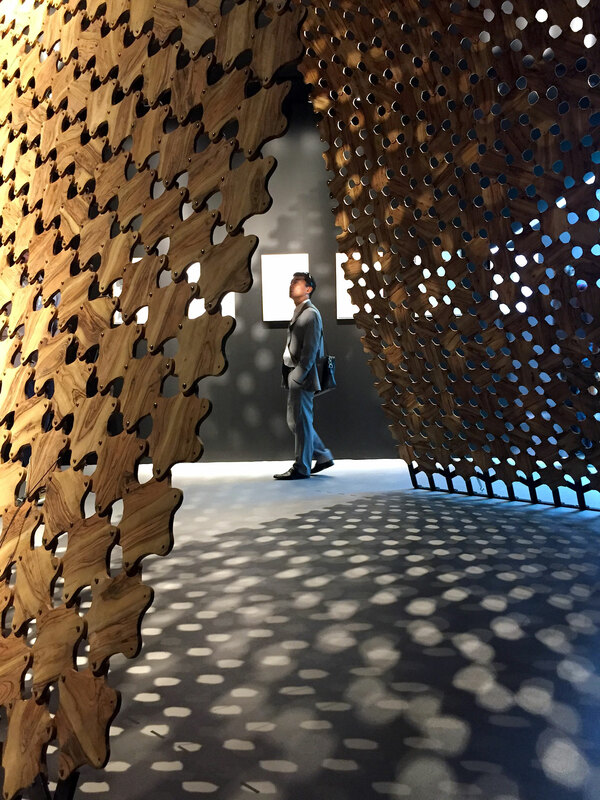 The experience of Dubai Design Week 2016 (DXBDW2016) was more than enough to inspire even the most jaded due to the sheer energy and enthusiasm that overtook this hot destination during October 25 - 28, 2016. 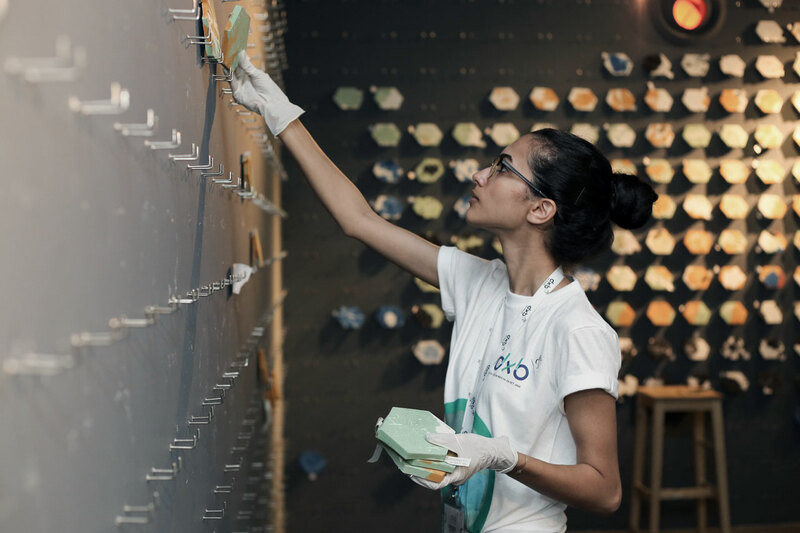 For the second year running, this internationally acclaimed design festival was held under the patronage of Her Highness Sheika Latifa bint Mohammed bin Rashid Al Maktoum, in partnership with Dubai Design District d3 and with the support of Dubai Design & Fashion Council and Dubai Culture & Arts Authority. It drew in a record breaking 40,000 international visitors who made their way to the desert capital to take in the more than 150 events spread throughout the city's venues, solidifying the fact that Dubai is truly a commanding design centre. This is underlined by the fact that the studios of five architecture giants - Santiago Calatrava, Zaha Hadid Architects, Foster + Partners and Benoy - are opening offices in Dubai Design District d3 in 2016 in response to the expansion of the local architecture industry which is forecasted to peak at $221.7 Billion in 2017. Dubai is furthermore determined to nurture the next generation of its home-grown design talents from step one, as the establishment of DIDI - Dubai Institute of Design and Innovation -a d3-based educational institution which was formed in collaboration with Massachusetts-based, M.I.T., and N.Y.C.- based, Parsons School of Design, proves. 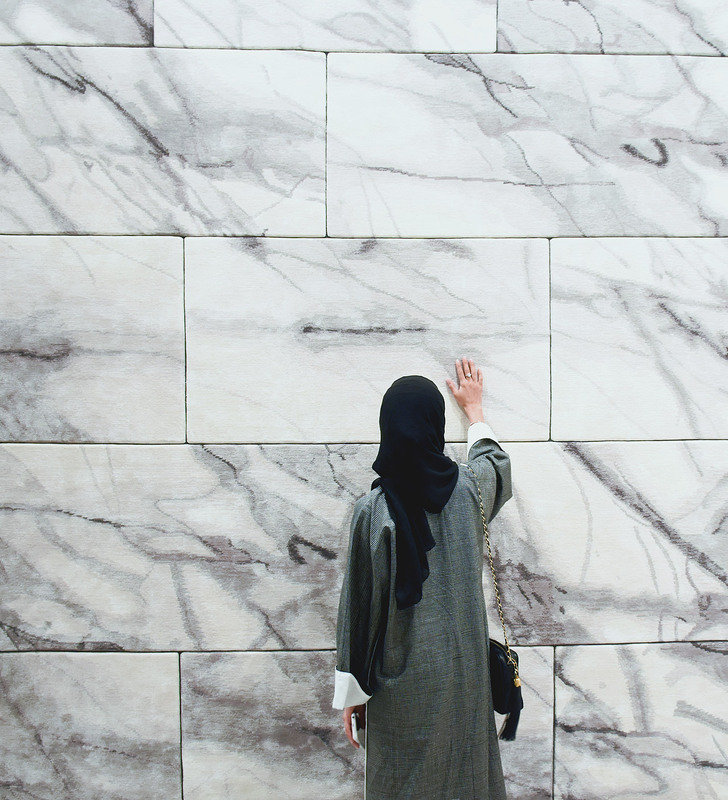 Dubai-based designer Aljoud Lootah interacts with the softest marble tiles in the world from the Floor to Heaven series by Michaela Schleypen at Samovar Carpets during Downtown Design Dubai 2016. BETULA CHAIR by Apical Reform at Downtown Design Dubai 2016. 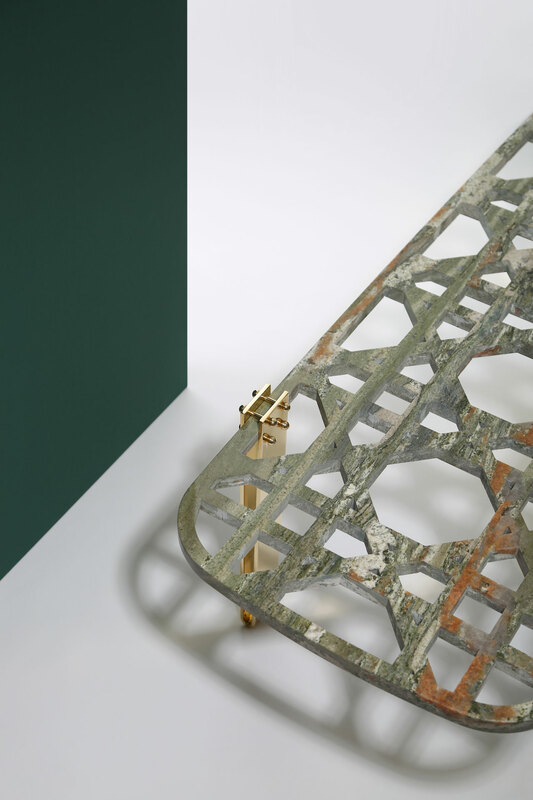 EVERLASTINGREEN coffee table in granit vert Gauguin , solid brass and metal, part of the Khayzaran/Fairuz collection by Lebanese interior architect and product designer Richard Yasmine. Photo by Bizarrebeirut. 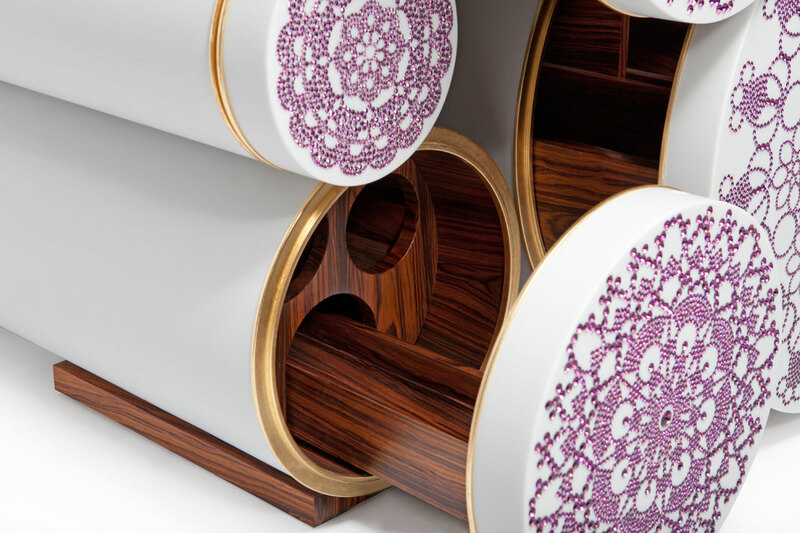 Khayzaran/Fairuz furniture series by Lebanese interior architect and product designer Richard Yasmine. Photo by Ieva Saudargaite. 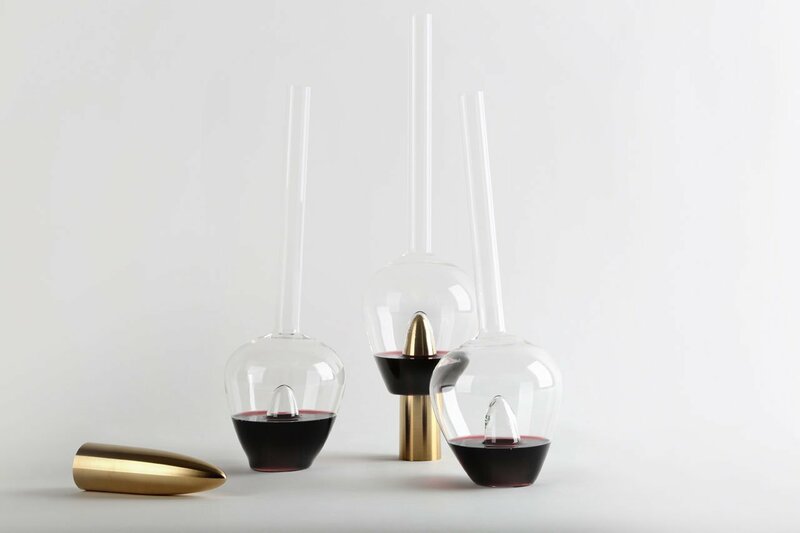 Plugged Carafes by Lebanese interior architect and product designer Richard Yasmine. 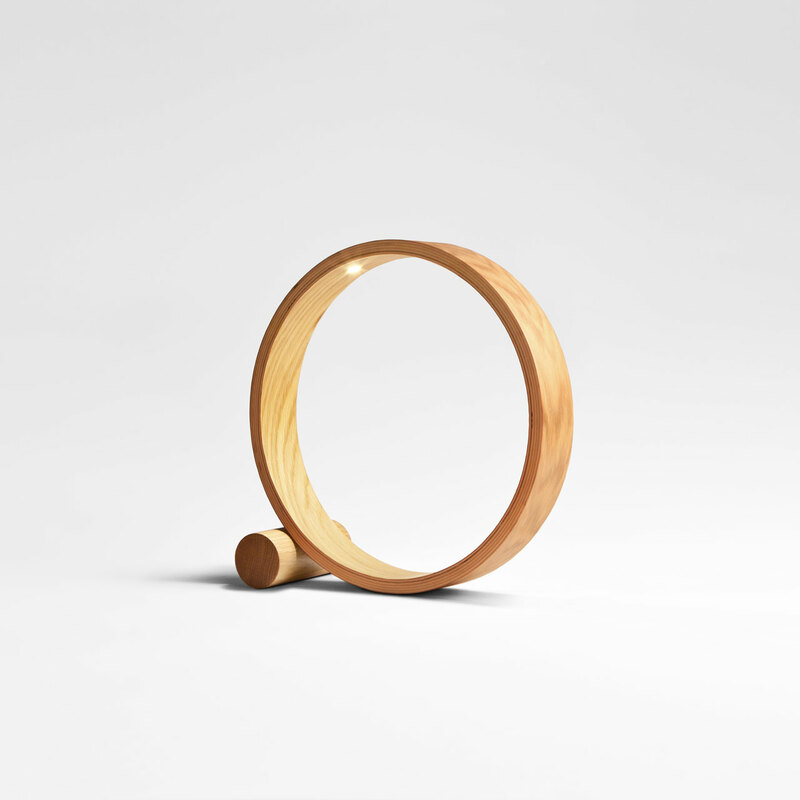 Made of solid brushed brass and a very thin hand blown borosilicate glass. Photo by BizarreBeirut. Plugged table lamp by Lebanese interior architect and product designer Richard Yasmine. 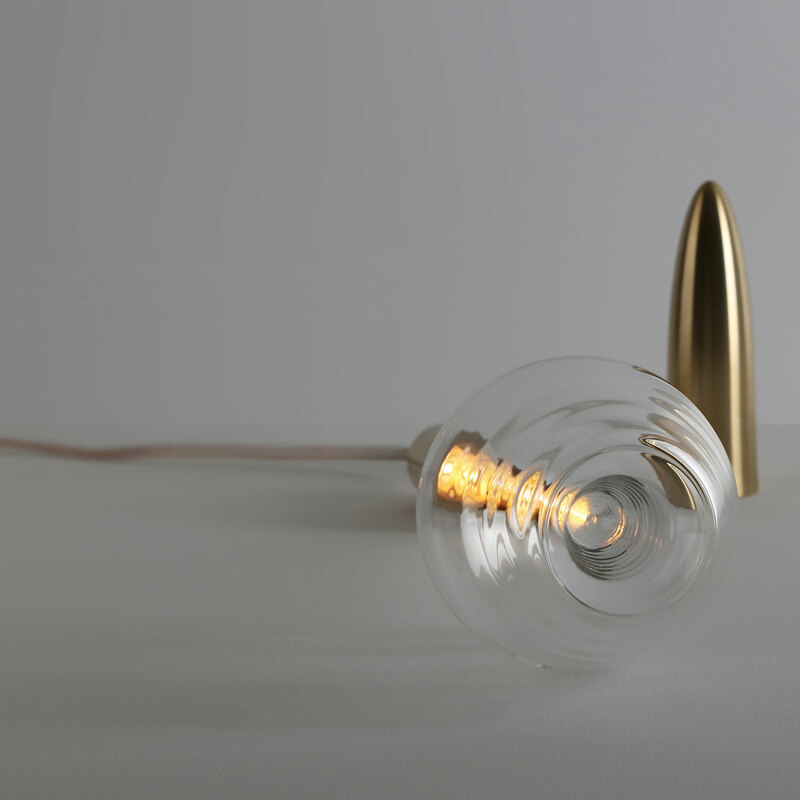 Made of solid brushed brass and a very thin hand blown borosilicate glass. Photo by BizarreBeirut. Monogram's Infographic Collection, launched during #DXBDW2016 at Bloomingdales, Dubai Mall. 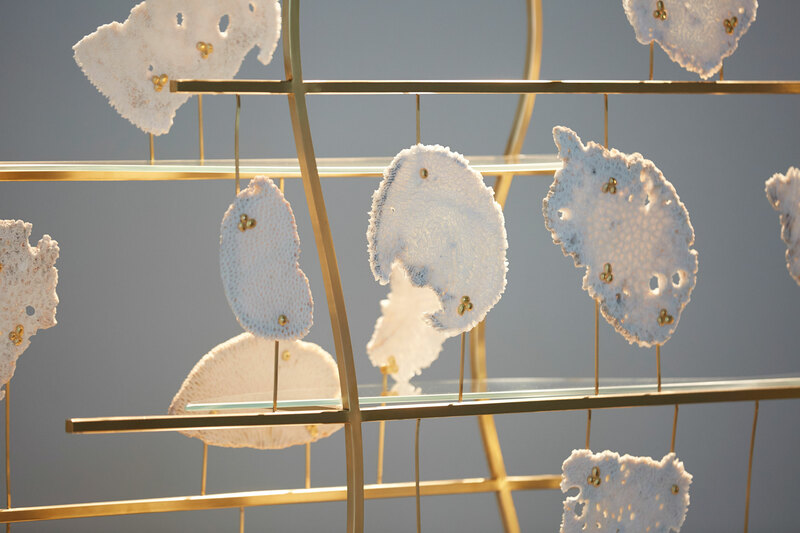 Statistical jewellery; multidimensional visual forms that tell the story of the UAE’s development through its people. 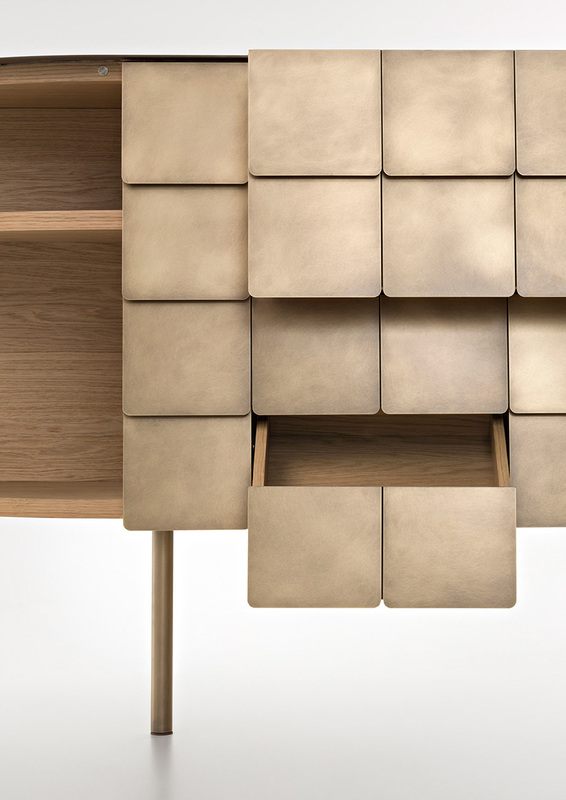 YOROI console by Alessandro Masturzo for De Castelli. Mass Imperfections’ by French-Palestinian architects Elias and Yousef Anastas composed of several handmade olive wood modules assembled into a structure that bears resemblance to both a piece of traditional Palestinian embroidery from a village in the hills of Judea and to a prop from the set of a science-fiction film from the 1970. Mass Imperfections. Palestine participation in Dubai Design Week, Abwab 2016. ​Mass Imperfections. Palestine participation in Dubai Design Week, Abwab 2016. Photo by Jose Balitian. Lights made from reclaimed coral by Zuleika Penniman at the Tanween exhibition at Tashkeel. Part of Tashkeel's Tanween Programme 2016. The central heart of DXBDW16 was once again the Dubai Design District d3 industrial complex. Here, designers opened their studios and visitors could admire artisans at work as well as a multitude of other activities, such as listen to a six-day program of educational speeches - including the keynote presentation by Spanish architect, Santiago Calatrava; or take part in hands-on jewellery making and typography workshops, as well as the thoroughly original Faces and Masks series of doll making workshops which were developed by VINNY especially for Dubai Design Week 2016. The Global Grad Show at d3 embraced the world by featuring a selection (curated by its creator, the writer, editor and designer, Brendan McGetrick) of the best of design to "Empower, Sustain and Connect" from the next generation –which included design students from as far away as the University of Toronto, the University of Berlin and Stanford, CA. 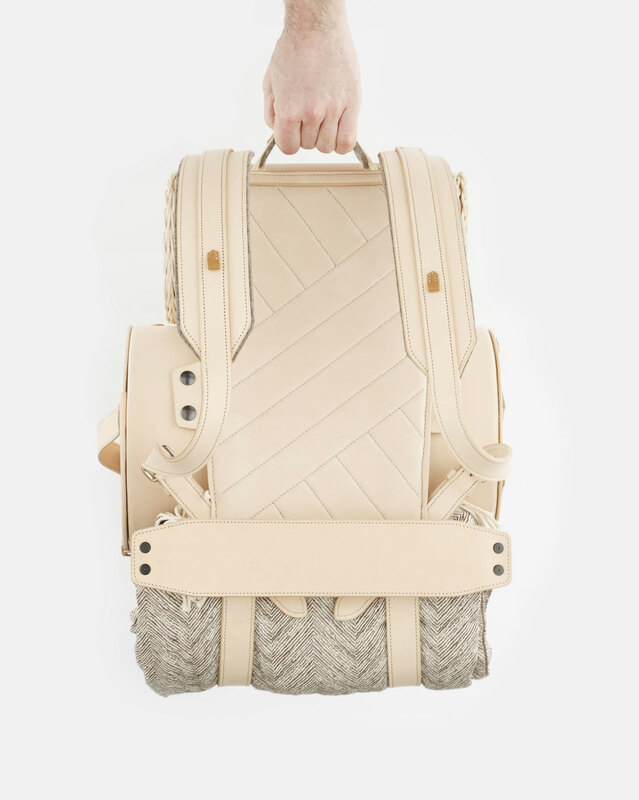 A few items that stood out were ECAL student, Panter & Tourron's Aventure Romantique leather and rattan and steel picnic bag; the Aeo asthma medication kit which focused on symptom awareness and conscious medication dosing created by Anna-Maria Schneider from the Umea Institute of Design Norrland University Hospital and Imperial College and Royal College of Art student Luca Alessandrini's amazing, Spider Silk Violin which utilized 35 cm long silk strands. A few other highlights we were drawn to at d3 were the outdoor installation, Hexalite, the kaleidoscopic mirage brain-child of Emirati designer, Zeinab Al Hashemi, created with Swarovski Crystals and mirrored steel, MONTROI's popup in celebration of "nomadism" showcasing the brand's hand-crafted travel bags and accessories (on display until the end of February ’17) and British designer, Tom Dixon's popup shop in collaboration with the leading UAE design dealer, Superstudio. Aerial view of the Global Grad Show 2016. 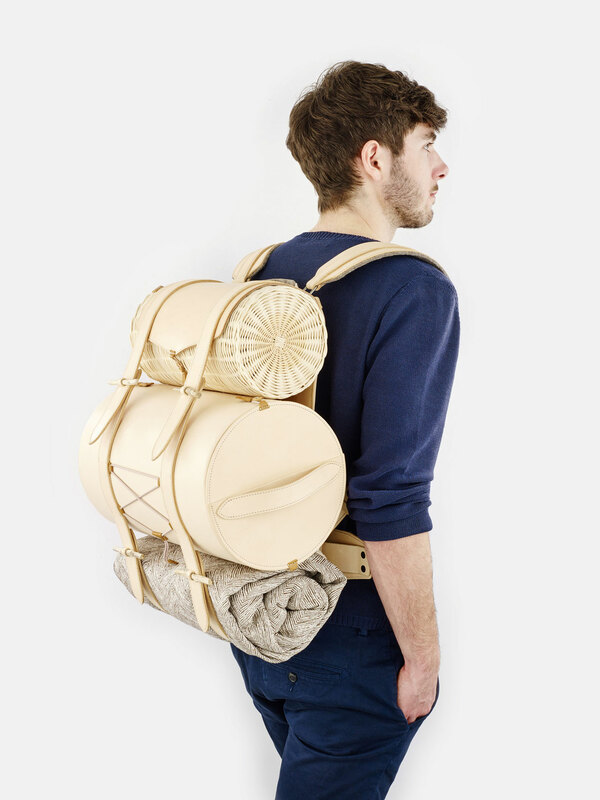 Aventure Romantique picnic bag designed by Alexis Tourron. Made of leather, rattan and steel, this bag contains several accessories that allow its users to improvise a romantic meal out in the open. Part of the Global Grad Show 2016. Aeo asthma medication kit focused on symptom awareness and conscious medication dosing. 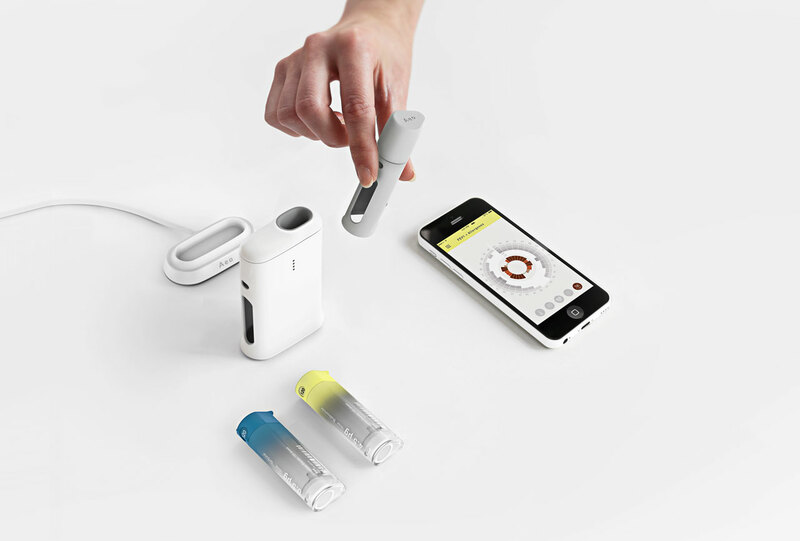 Aeo asthma medication kit focused on symptom awareness and conscious medication dosing. Part of the Global Grad Show 2016. 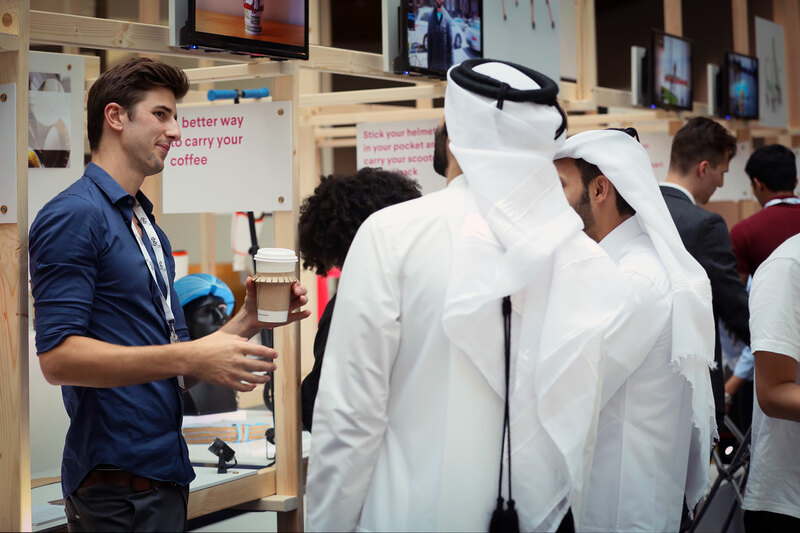 French designer Fabyan Blomme from Emily Carr University of Art and Design, shows his MOUNTAINRIM COFFEE SLEEVE to the visitors of the Global Grad Show 2016. 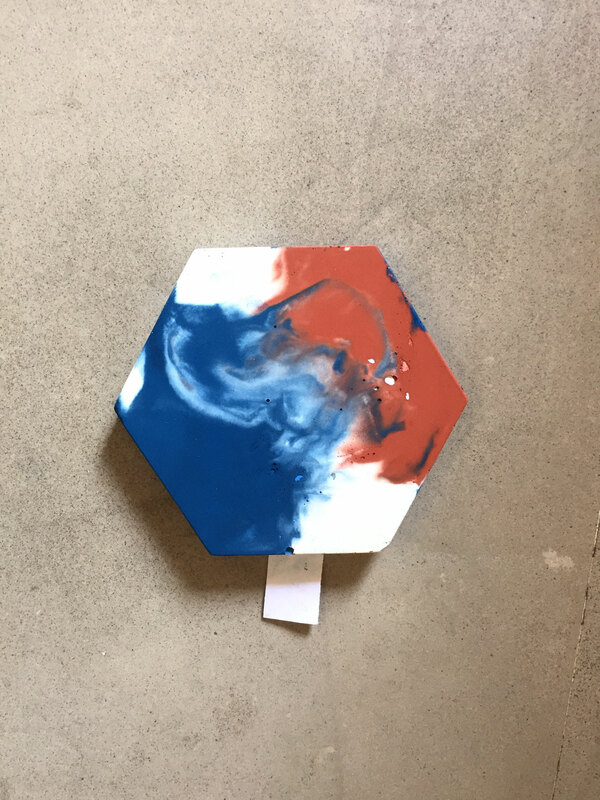 His project replaces the coffee sleeve’s flat surface with “interactive folding” that provides a better grip for the user and decreases the chance of spillage whilst moving. 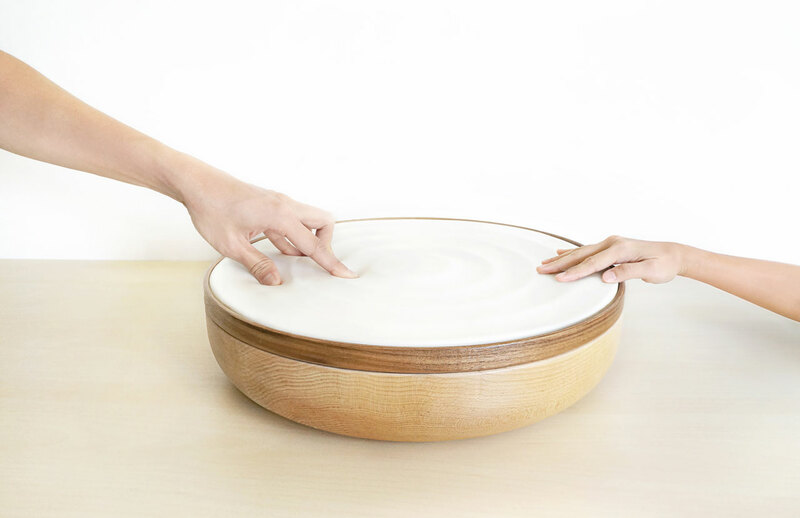 SYNCHRONY by Singaporean designer Kenneth Tay. A therapeutic music platform that helps parents and children with autism develop intimacy and understanding through improvised music play. Graduation Project by Kenneth Tay. 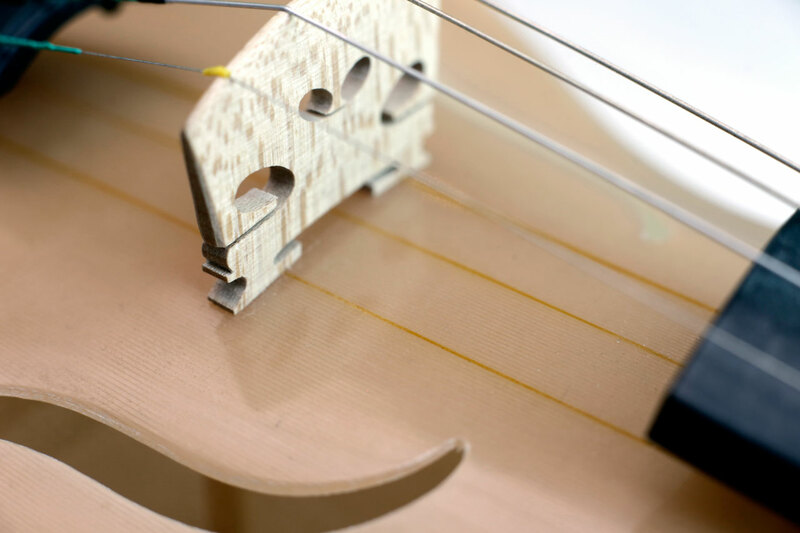 Spider Silk Violin (35 cm long strands) by Luca Alessandrini. Graduation Project by Luca Alessandrini. Innovation Design Engineering, Imperial College and Royal College of Art. 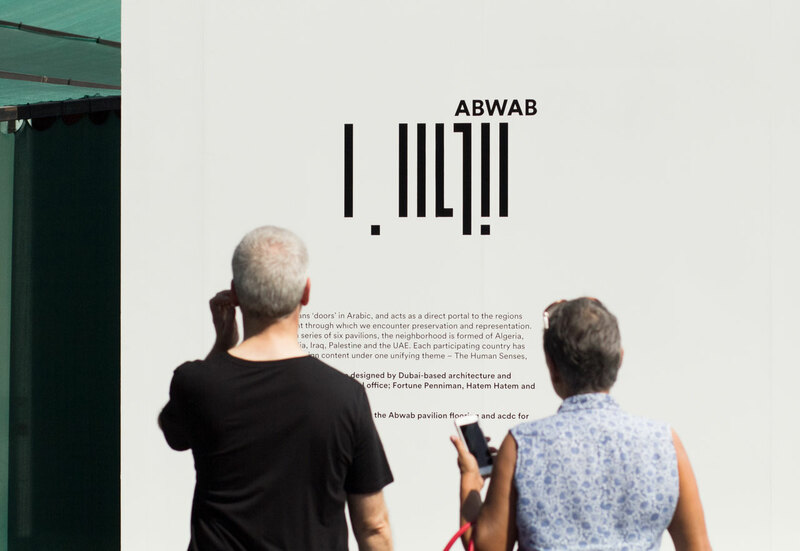 A major initiative of Dubai Design Week, Abwab is a series of six pavilions built to celebrate and showcase the work of the most exciting designers, studios and curators from six different countries in the MENASA region. An investigative collaboration between designers Maitham Al-Mubarak and Othman Khunji, and the team at Bahrain Authority for Culture & Antiquities,. The process of renewing the dormant craft of pottery was presented as the generating of a customisation process and interactive exhibition. Unearthing. Bahrain participation in Dubai Design Week, Abwab 2016. Memoir Bar by Thukral & Tagra ( New Delhi-based design duo Jiten Thukral and Sumir Tagra. Visitors had to pick a memory and write it down on a piece of paper. 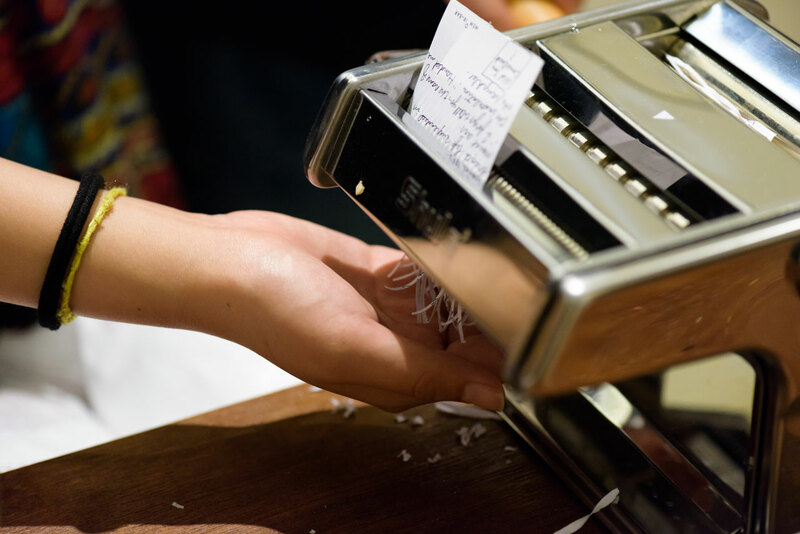 Shred it into a fine form and watch it being made into a tile. Memoir Bar. India participation in Dubai Design Week, Abwab 2016. Tab tab fi d'zairwatam, Drumming from Algiers to Tamanrasset. Algeria participation in Dubai Design Week, Abwab 2016. The interactive experience of the Algerian pavilion consisted of graphic surfaces displaying representations of sounds created through an arrangement of uniquely designed percussion instruments that compose a vibrant audio landscape. Variations of the ‘galal’ and ‘derboukas’, traditional Arabic drums, were placed above mirrored flooring enchanting audiences with their reflections. 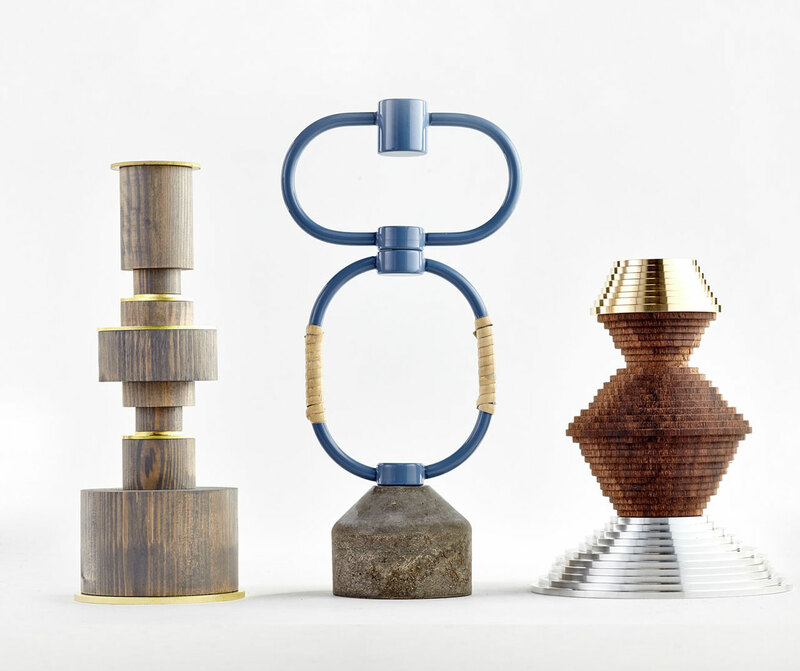 Across the street from d3 stood the grand tent housing Downtown Design Dubai, the region's design trade fair of choice, which also introduced new brands from other international design weeks to this regional market (Addis Ababa, Barcelona, Beirut, Reykjavik and Taipei). Meanwhile the design initiative, Abwab ("doors" in Arabic), stayed local by celebrating the Menasa region's creativity and talent with designers from ALGERIA (painter, Hellal Zoubir's interactive audiovisual landscape featuring Algerian drums, Tab tab fi d'zairwatam: Drumming from Algiers to Tamanrasset), BAHRAIN, INDIA (multimedia artist duo's Thurkral & Tagra's Memoir Bar), IRAQ, PALESTINE (French-Palestinian architects Elias and Yousef Anastas' reference to traditional olive wood carvings in their amazing wood module, Mass Imperfections installation) and the UAE. The exhibition, Iconic City: Cairo Now! City Incomplete was a jaw dropping amalgam of the works of over 64 Egyptian architects, designers, entrepreneurs and graphic artists. Curated by Cairo-based architect, researcher and writer, Mohamed Elshahed, they worked on a remarkable presentation - comprised of architecture; graphic and typeface design; product and furniture design - that highlighted Cairo's anciently-rooted but ever-changing design landscape, inspired by the varying stages of the red brick housing developments which comprise the contemporary cityscape of the ancient city. The poster of "Iconic City: Cairo Now! A City Incomplete", an exhibition curated by Cairo-based architect, independent researcher and writer Mohamed Elshahed. LET'S PLAY! by Ghada Wali, part of the "Iconic City: Cairo Now! A City Incomplete" curated by Cairo-based architect, independent researcher and writer Mohamed Elshahed. Introducing the arabic language to early learners or foreigner speakers, by creating a full arabic abstract display typeface through playfully building each letter using colored lego blocks. Each letter is explained through sound, form & words in function, with the equivilant in latin, resulting in a fun pocket book with the 29 letters simplified int heir initial,medial, final & isolated forms plus a dictionairy 0f 400 words in addition to an encyclopaedia of pantones. 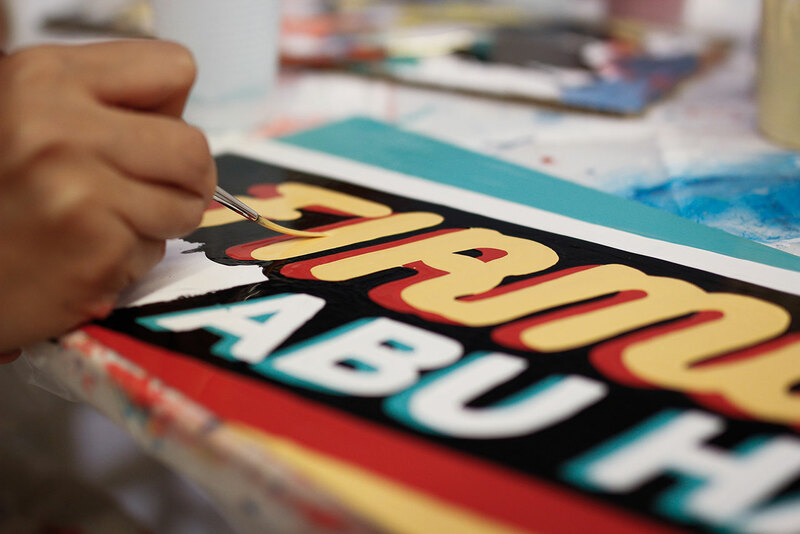 Graphic design poster by Islam Hassan, part of the "Iconic City: Cairo Now! A City Incomplete" curated by Cairo-based architect, independent researcher and writer Mohamed Elshahed. 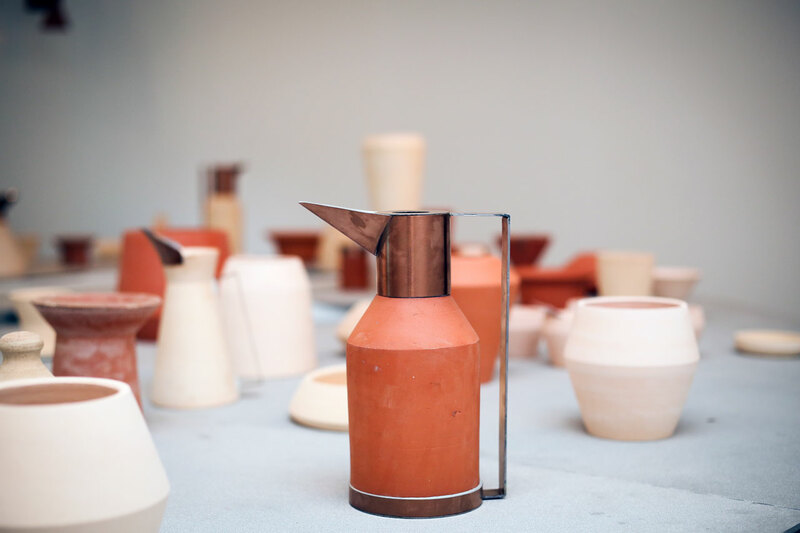 The Clay Steamers and Clay Bakers by Menn Baladha - an Egyptian-based design studio founded by Alik Mikaelian, Amira El-Shawarby, Caroline Shoshanian and Salma Adel, were on display at the "Iconic City: Cairo Now! A City Incomplete" exhibition curated by Cairo-based architect, independent researcher and writer Mohamed Elshahed. Lighting Wheel by Mohamed Nabil Labib at the "Iconic City: Cairo Now! A City Incomplete" exhibition curated by Cairo-based architect, independent researcher and writer Mohamed Elshahed. 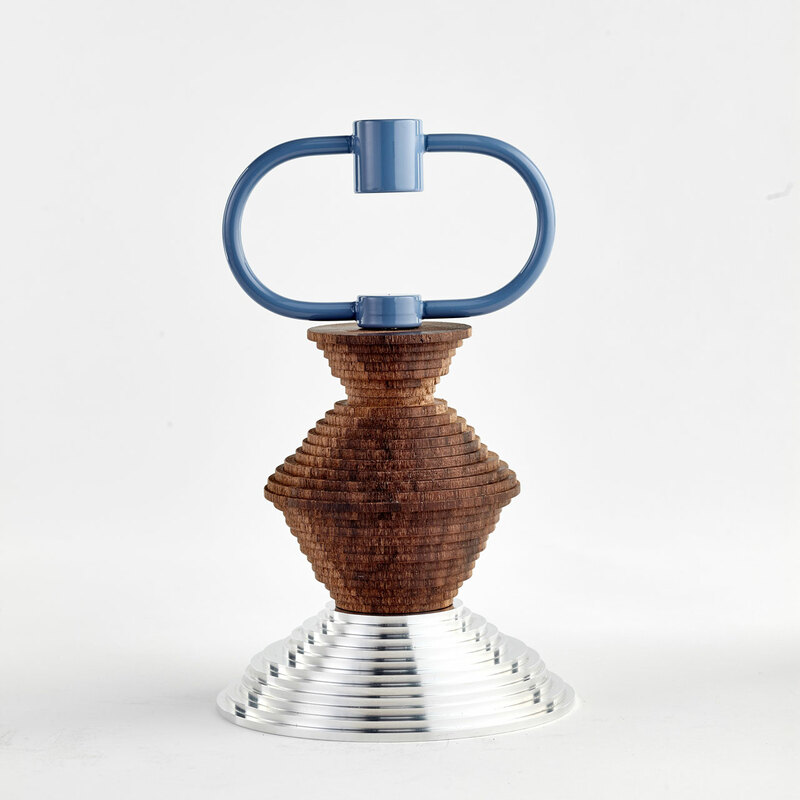 This is not a pipe, by Ehem concept, the brainchild of Egyptian designer Dina Naguib. Spotted on the "Iconic City: Cairo Now! A City Incomplete" exhibition curated by Cairo-based architect, independent researcher and writer Mohamed Elshahed. EXHIBITION at Alserkal Avenue by design studio Ape Creative explored the culture and the craft of hand painted lettering on signage. But the festivities weren't localized; the whole of Dubai seemed to be in on the design frenzy arising from the array of imaginative installations, awe-inspiring shows and ingenious presentations and workshops held throughout the city. Design aficionados could plan a perfect day starting with a morning spent strolling through the art-lovers paradise of Alserkal Avenue - to check out BYAHE: A TYPOGRAPHIC EXPLORATION EXHIBITION by design studio Ape Creative which explored the culture and the craft of hand painted lettering on signage - before catching the inimitable collaboration, Mapping the Burj designed by Studio MrWhite and Ascension designed by Yusuke Murakami and Tangent Design & Invention Ltd, which made the world's tallest building, the Burj Kalifa come alive through mesmerizing animations once the sun went down! This being Dubai, DXBDW16 also saw its stores getting into the design festivities. 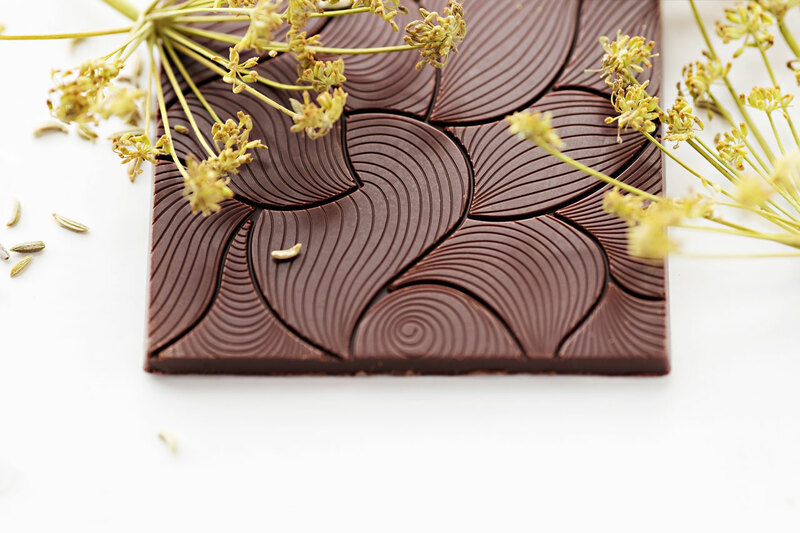 Chocoholic visitors didn't miss visiting the new factory of Chocolatier Mirzam, which opened its doors for guests to salivate as they watched the production of its Monsters & Maps chocolate bars, which were then inventively wrapped in Sheikha Wafa Hasher Al Maktoum's beautifully illustrated paper. 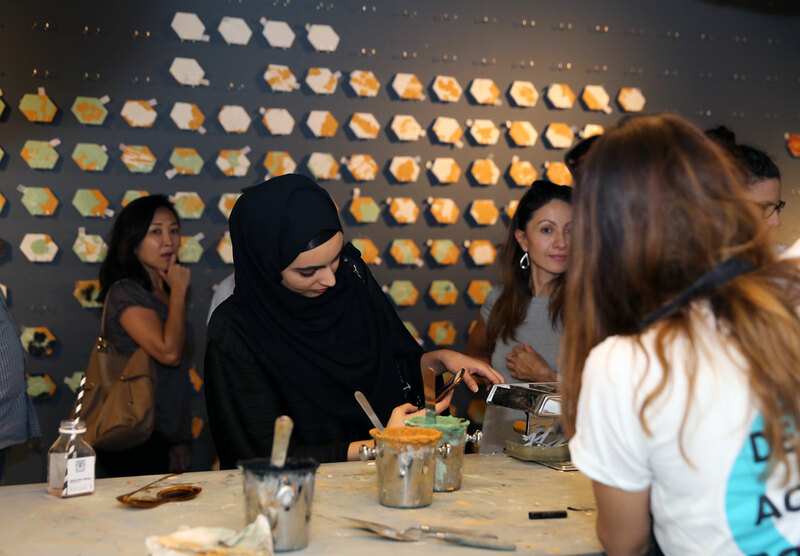 Those watching their waistlines could head over to see Richard Yasmine - among other designers - at the o’de rose Concept Store at the ARABESQUE ARCHI-LAB exhibition, which showcased a dizzying array of jewellery, products and photography inspired by Islamic architecture. 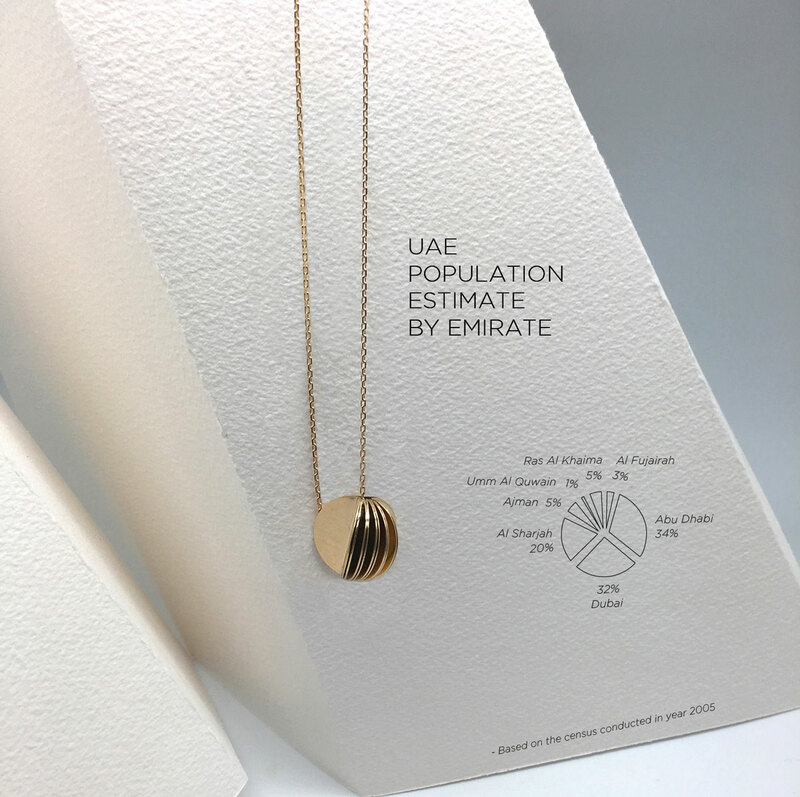 And then there was also MONOGRAM's Infographic Collection of Statistical jewellery presented at Bloomingdale's in the Dubai Mall, a beautiful collection that utilizes multidimensional visual forms that tell the story of the UAE’s development through its people. 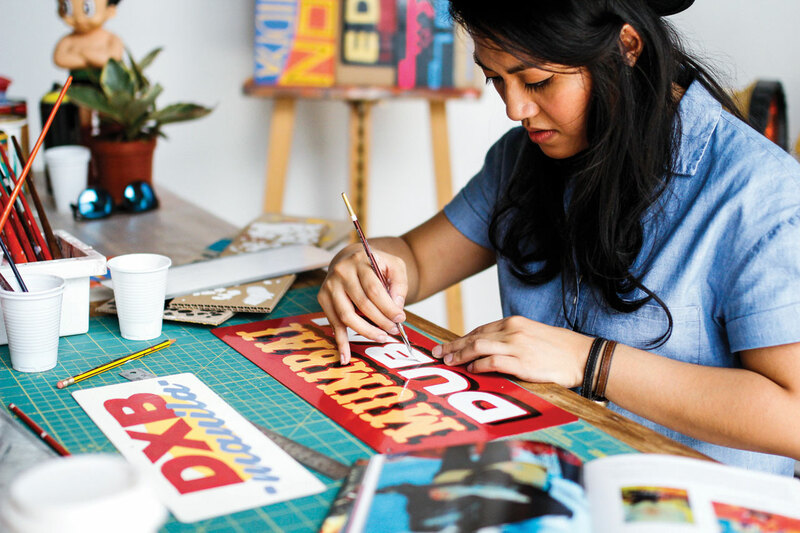 BYAHE: A TYPOGRAPHIC EXPLORATION EXHIBITION at Alserkal Avenue by design studio Ape Creative explored the culture and the craft of hand painted lettering on signage. IKEA pop-up at Dubai Design District (d3). 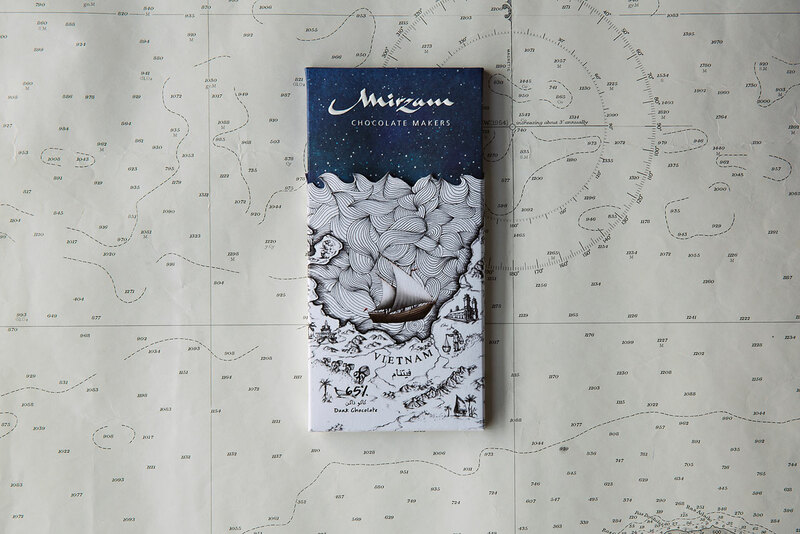 For the first edition of the Mirzam Design Series, chocolate makers have worked in collaboration with Emirati designer and photographer Sheikha Wafa Hasher Al Maktoum. 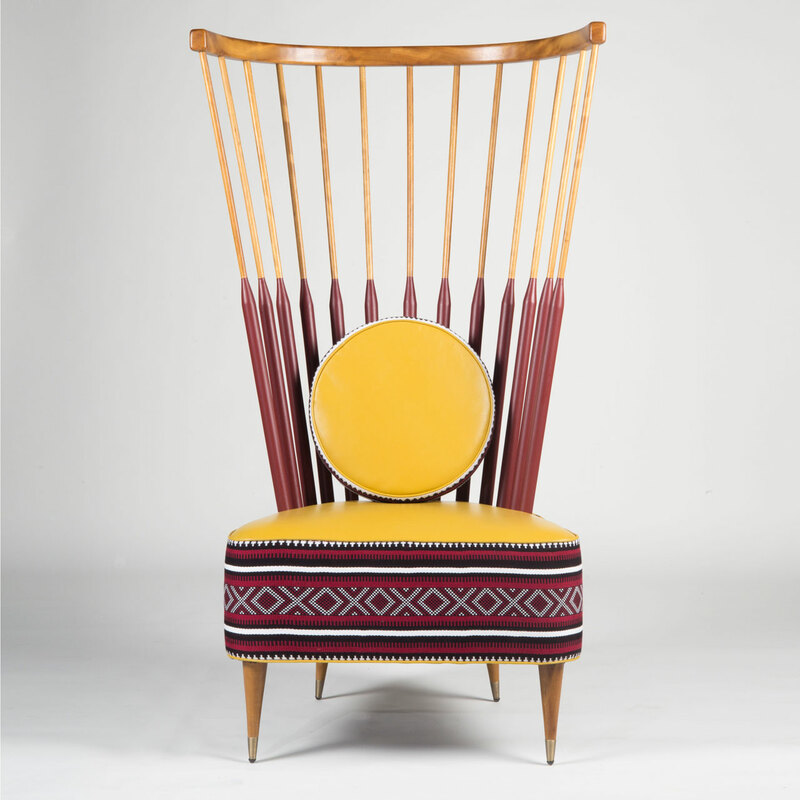 High back Moza chair by Studio MUJU (Jumana Taha and Mentalla Said) at the Tanween exhibition at Tashkeel. 1+1+1 experimental collaboration between designers from three Nordic countries – Hugdetta from Iceland, Petra Lilja from Sweden and Aalto+Aalto from Finland. DesignMarch (Iceland) @ Downtown Design Dubai 2016. 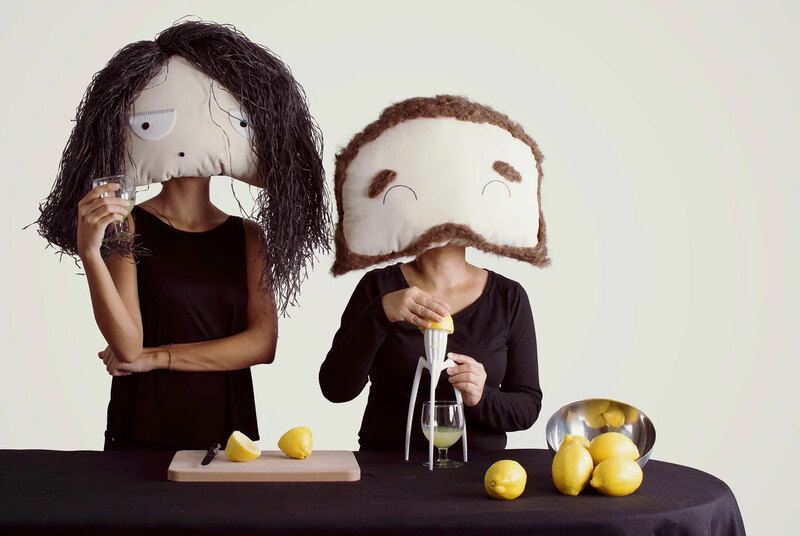 The amazing Faces and masks series of doll making workshops by VINNY, developed during Dubai Design Week 2016. Morning Ritual by Lebanese product designer and photographer Paola Sakr. 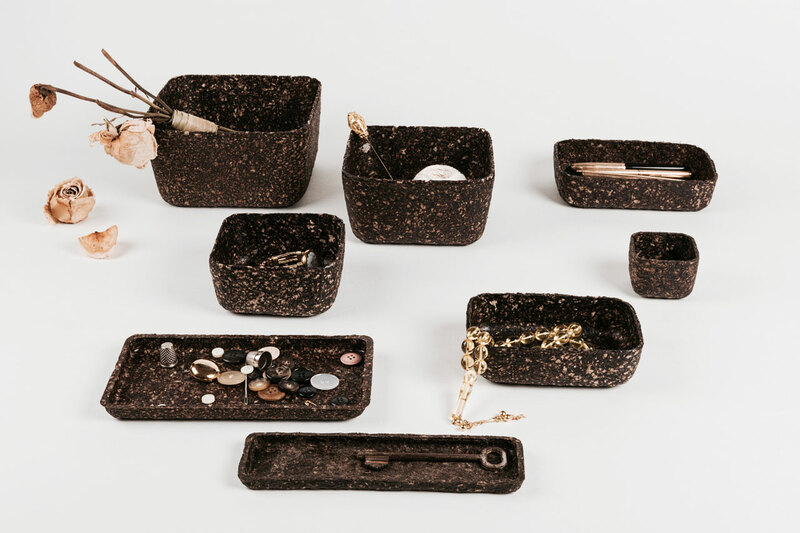 A series of biodegradable containers made of coffee grounds and newspaper waste. Beirut Design Week at Downtown Design Dubai 2016. 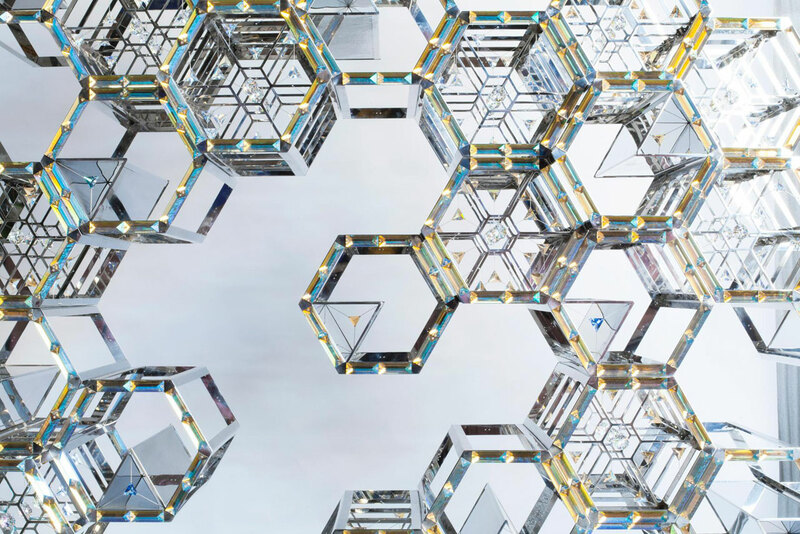 Swarovski debuts at Dubai Design Week 2016 with a mesmerizing specially commissioned outdoor installation by Emirati designer Zeinab Al Hashemi. 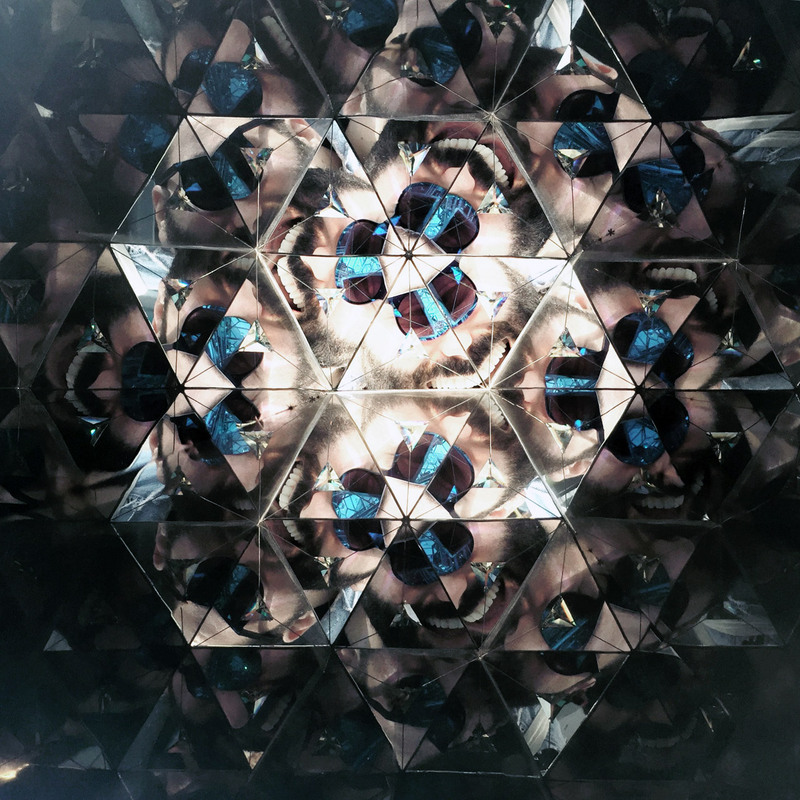 An outdoor installation, titled HEXALITE designed around the geometric and mathematic repetition of the number 3. 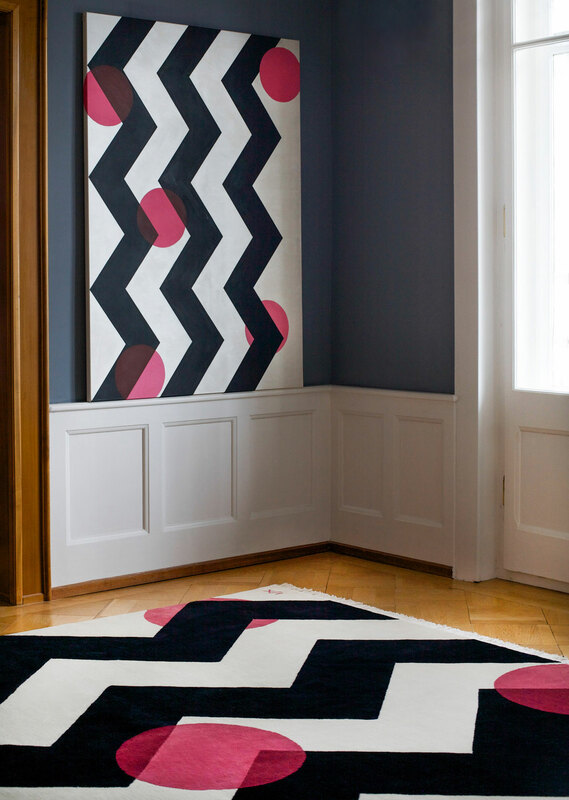 Cecilia Setterdahl turns her canvas compositions into beautiful handcrafted, limited edition carpets. The Cities contemporary design and art showroom (in Riyadh and Dubai) curated an exhibition in the setting of the famed Pan-Asian restaurant & bar Novikov in Dubai. 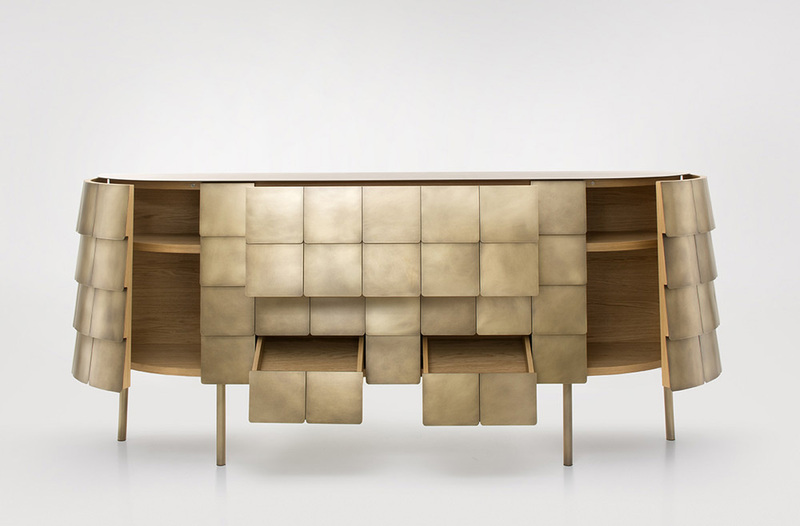 Featured here : Limited edition Enxoval cabinet-bar by Helena & Carlos Costa for ALMA DE LUCE. The Cities contemporary design and art showroom (in Riyadh and Dubai) curated an exhibition in the setting of the famed Pan-Asian restaurant & bar Novikov in Dubai. 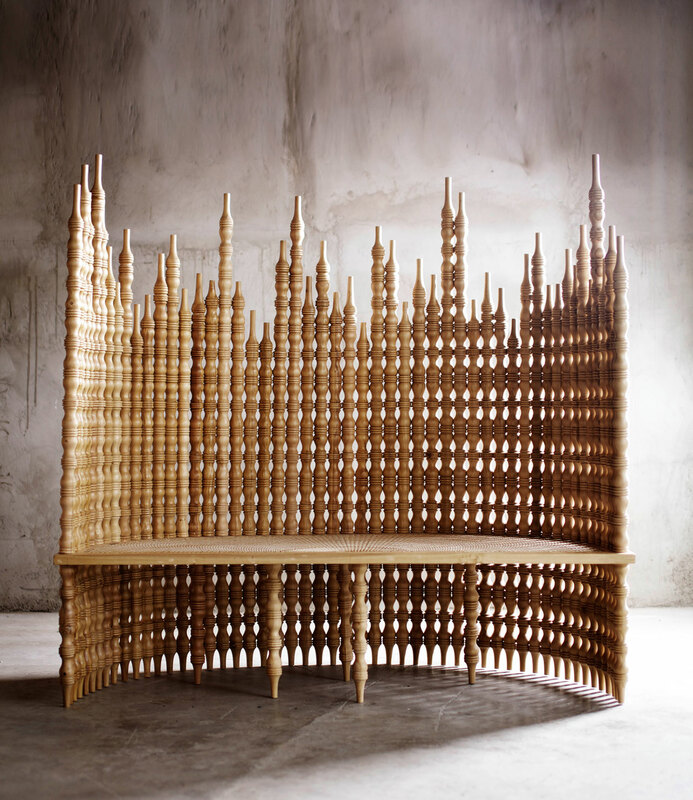 Featured here : the Gregoria Lounge by Philippine designer Ito Kish. The Cities contemporary design and art showroom (in Riyadh and Dubai) curated an exhibition in the setting of the famed Pan-Asian restaurant & bar Novikov in Dubai. 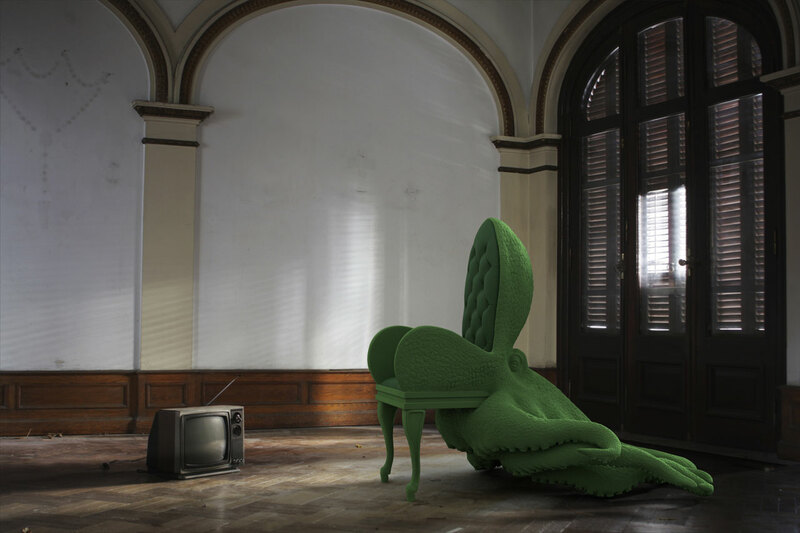 Featured here : Octopus Chair by Spanish artist and designer Maximo Riera. 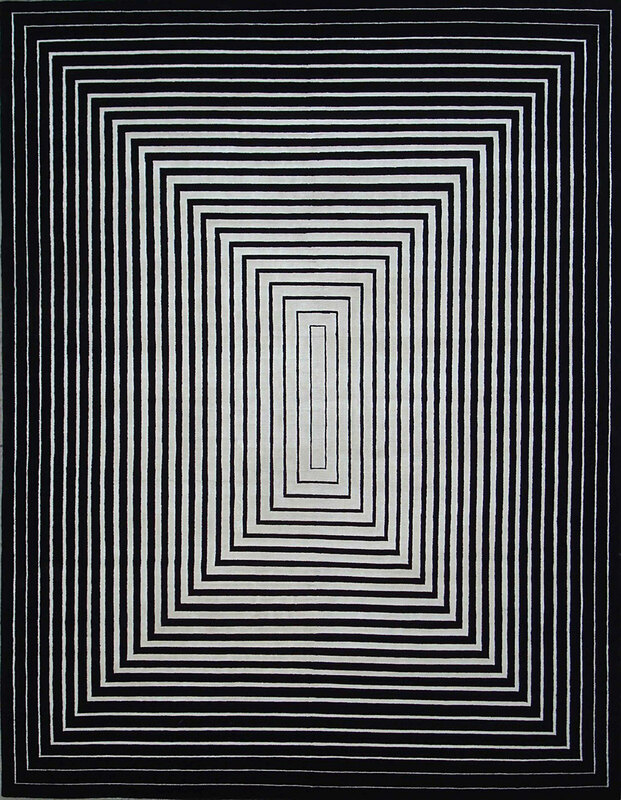 'Rehab' rug by Illulian at Downtown Design Dubai 2016. 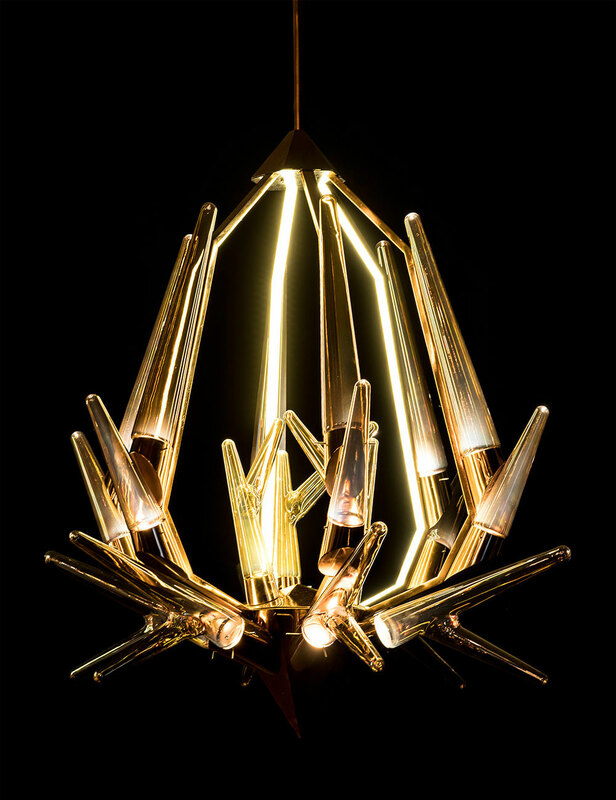 The Stag chandelier by New Delhi-based Klove Studio, inspired by the Nordic Antelope - hand crafted in glass. 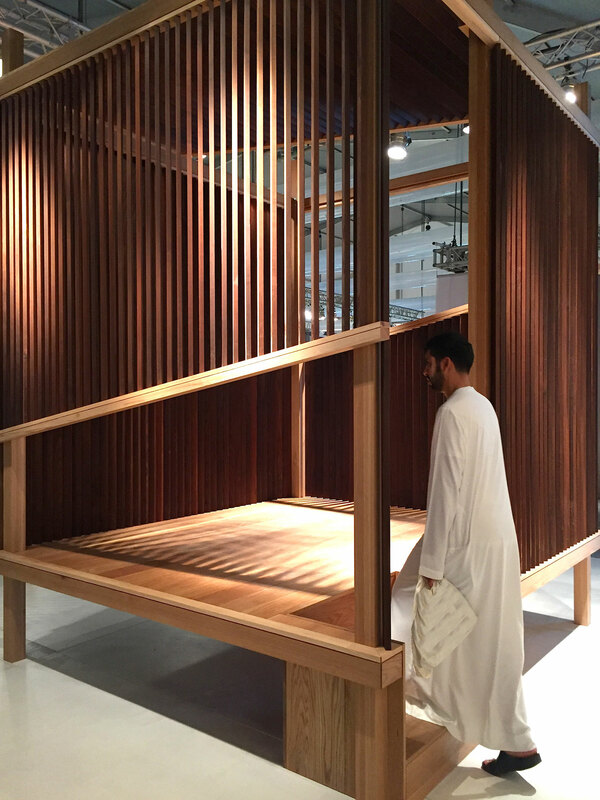 American Hardwood Export Council (AHEC) teamed up with T.ZED Architects - an UAE Based Progressive International Architecture & Design Practice - for the creation of The Cocoon, a floating timber installation using Thermally Modified Ash which was exhibited at Downtown Design Dubai 2016. 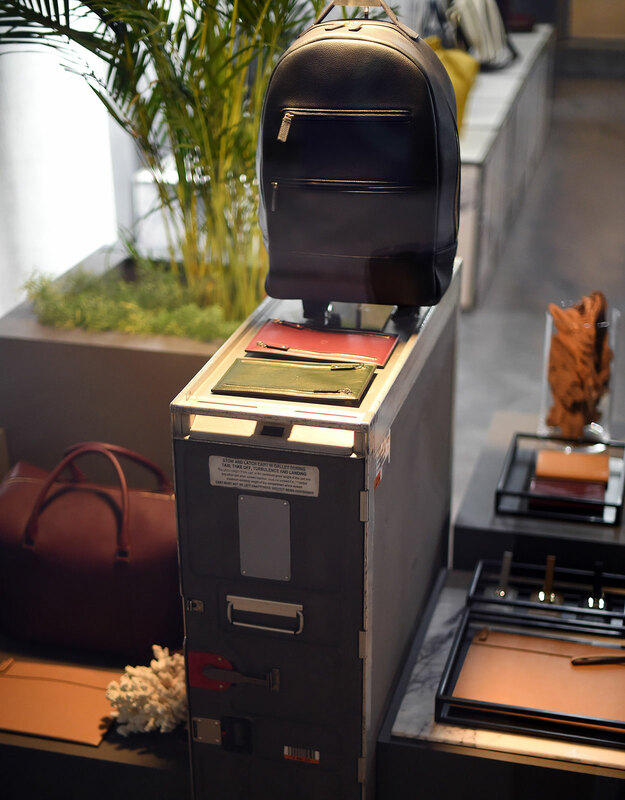 MONTROI's hand-crafted travel bags and accessories will be available at a popup in Dubai Design District d3 until the end of February ’17. AI Lamp by Anurak Suchat for META Design, spotted at Taiwan Designer's Week presentation during Downtown Design Dubai 2016. 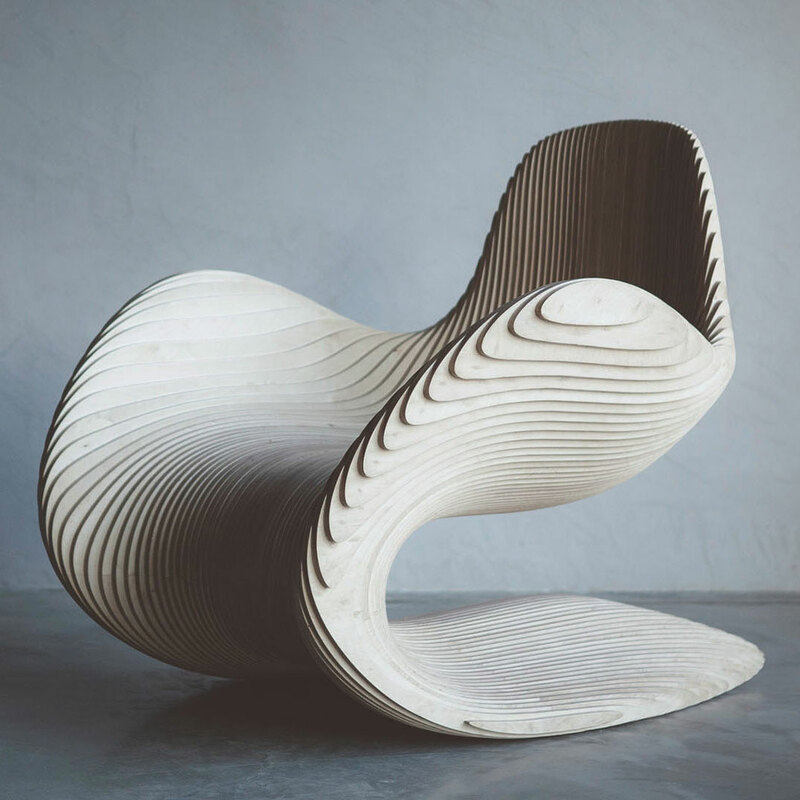 Babu chair by Jordi Ribaudí of toru.barcelona. Barcelona Design Week at Downtown Design Dubai 2016. 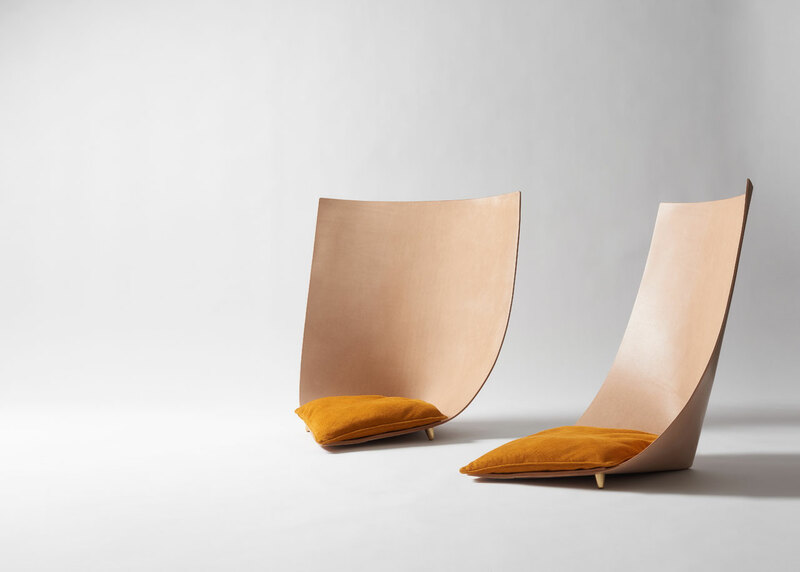 Babu chairs by Jordi Ribaudí of toru.barcelona. 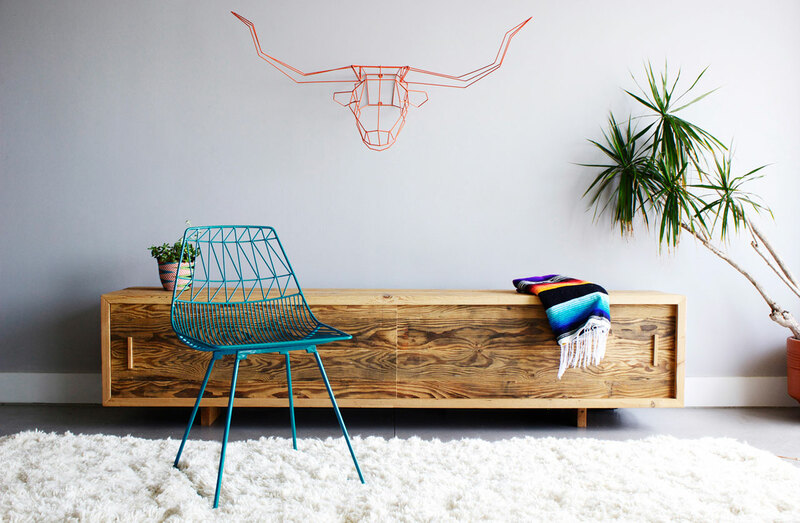 The Lucy Chair by Los Angeles-based furniture, design and manufacturing studio Bend Goods.